Oh Where Oh Where to Put the Polytank? Peter and Wahab monitor the water treatment center in Kpachiyili. This is a typical center placement. It’s located right next to the dugout. Look at how green it is! This picture was taken during the rainy season, as you can see not flooded! The placement of the CWS water treatment center is key in running a successful water business. Fellows and CWS translators ask very specific questions when it comes to finding a spot for the polytank. 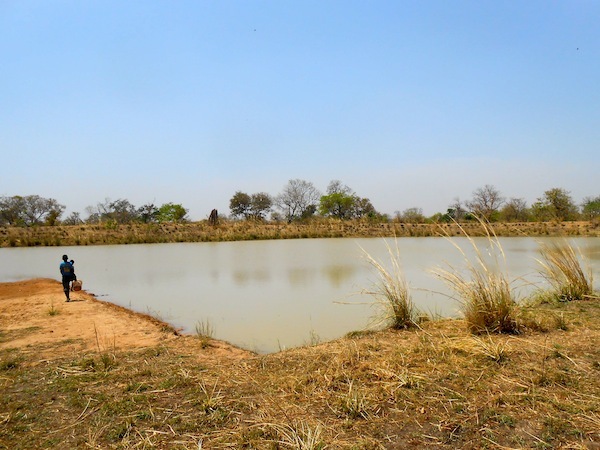 The villagers select where they want their water treatment center based on what dugout or water source they use for the majority of the year and look for an area that does not flood during the rainy season. But what happens to the water business when a dugout dries up or when people use multiple water sources throughout the year? In some villages, the women entrepreneurs figure it out for themselves. Adamu and Salamatu in Gariezegu found a metal, moveable polytank stand that was used in the school, which allowed them to move the water treatment center to various wells in the village. 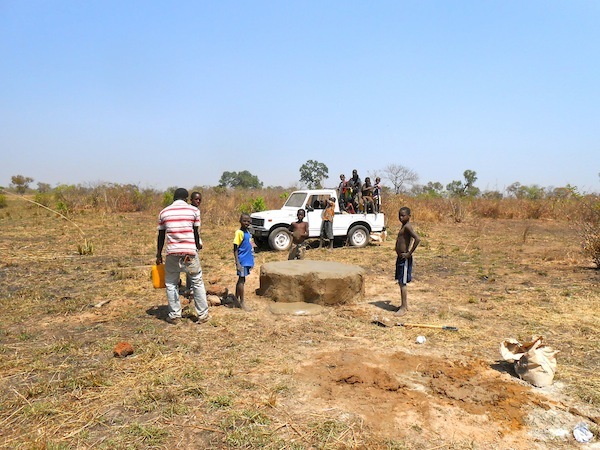 After the rainy season, Lasinchi and Mariama in Tacpuli moved the center to a well that was closer to the village and placed the polytank on large branches, using a hose to fill safe storage containers. For the most part though, the women who run the centers have a hard time coping with seasonal transitions on their own. The chairman in Gariezegu posing with the metal polytank stand. The CWS policy for moving water businesses in the past has been that the women have the freedom to move the centers as long as they come up with the materials to build polytank stands themselves. CWS wants the centers to be as self-reliant as possible. If we continually help the water businesses to thrive off of our dime, then they will not be sustainable in the long run. But where is the line drawn? We’re realizing on the monitoring side that there is a monetary limit to what we can ask of the women. 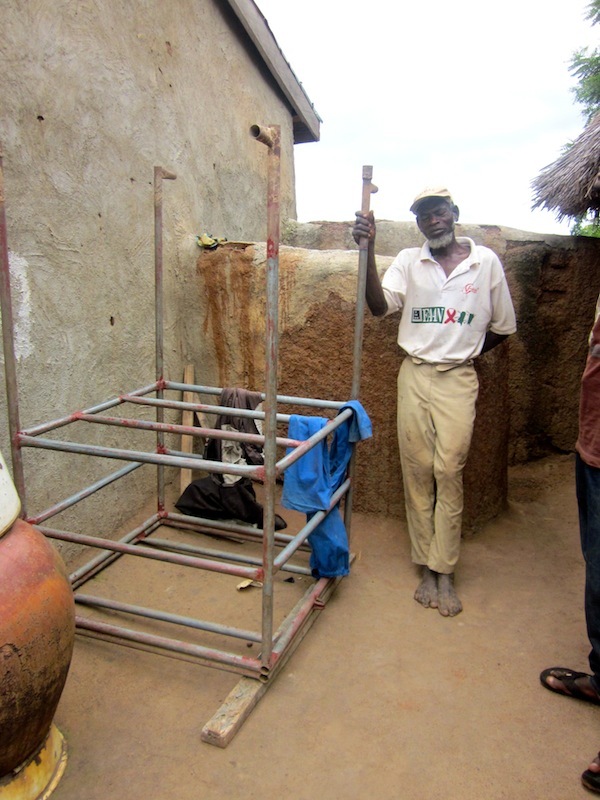 It costs roughly $38 to build a polytank stand in Ghana. This is more money than most women make in a month working at the water treatment center. It’s time to start building polytank stands! 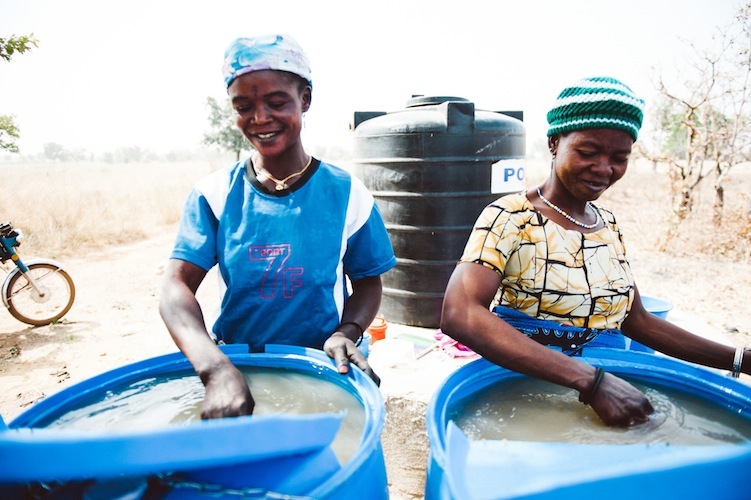 We’ve decided that by building polytank stands for communities that use multiple water sources, this will take a large burden off of the women who run the water treatment centers. So far we’ve mapped out 11 communities that will need polytank stands built at another source in the next 6 months: Bogu, Djelo, Gbandu, Gbung, Kpalbusi, Kpanayili, Tacpuli, Tohinaayili, Yapalsi, Yipela and Zanzagu Yipela. The communities will still be responsible for moving the polytank and blue drums to the new location when they need to (and making decisions about when to move it) but CWS will fund the building. Our first stop is Djelo, as their water source situation poses the largest threat to the community. The dugout where the center was initially built is starting to dry. The women, Zelia and Fuseina, predict that the dugout will be dry within the month. Luckily, there is another dugout a little farther away that will not dry up. 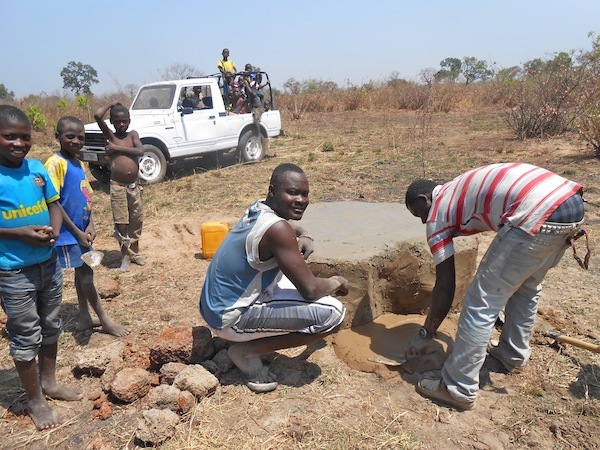 This weekend CWS field staff, Shak and Amin, went to Djelo to build a polytank stand at this second dugout. We wanted to get the stand built before the dugout dried, to make the transition as smooth as possible. This will not cause any behavioral disruption because the villagers of Djelo are going to start going to that second dugout very soon. The stand in Djelo is complete! 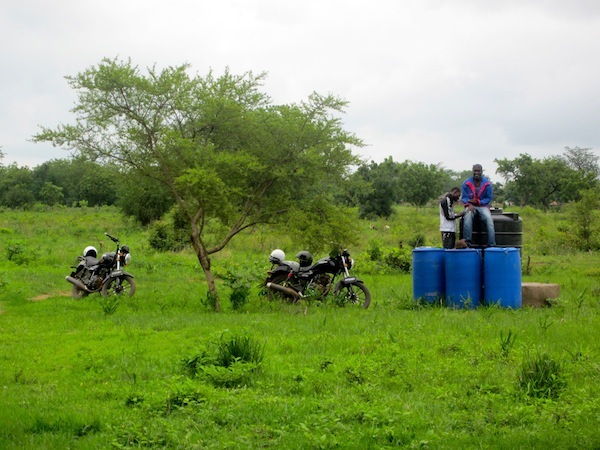 The CWS technology in Ghana will only work if there is water to treat. The water businesses will be most successful if they are located next to the water source that the villagers use the most. If that source changes throughout the year, then the center needs to change with it. More updates to come as we continue to build! This entry was posted in The Saha Team, Uncategorized and tagged africa, development, Ghana, season, social entrepreneurship, sustainability, technology, water, water treatment. Bookmark the permalink. 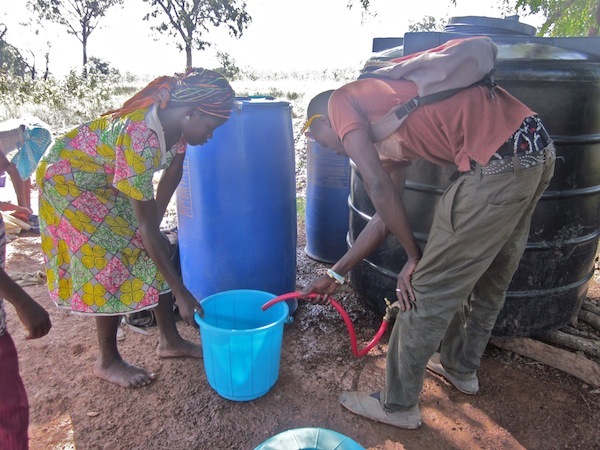 Having lived without a polytank in Ghana for 2 weeks, we know how important this is!